The Vase of the Life Essence of the Earth (Sa-bcumd Bum-ba) is meant to bless and empower the earth where it is placed. It is a way of putting positive mind energy into the natural environment. The benefits of the Vase as told in ancient texts were the prevention of problems due to imbalances in the four elements of earth, water, fire, and air. The Vase prevented the degeneration of the life essences of the Earth so that fruits, grains and vegetables would thrive and be tasty and nutritious. It restored the life force and fertility of the ground itself, particularly if the ground had been misused or the soil depleted. The Vase protected the land from the ravages of earthquakes, floods, thunder and lightning. it was considered beneficial in preventing damage from pollution, erosion, and over fertilization. It is said the blessings from the Vase extend for fifteen miles around where the Vase is placed. Within this area people will experience good health, long life, wealth, protection, and peace. Contentions within families or groups will be reduced and working relations will be good. Prosperity will prevail. The vital essence of the earth is concentrated into the Earth Treasure Vase through the practice of the very ancient transmissions of empowerment brought to Tibet by mahasiddhas in the eighth century. 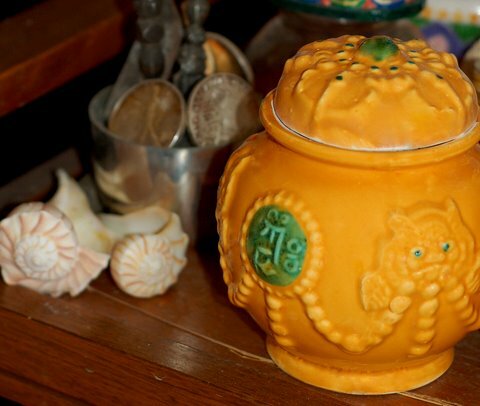 The Earth Treasure Vase is empowered by a series of pujas done by Lama Kunga Rinpoche. He transmits thought images to the Vase invoking Bodhisattvas, higher spirits, and wealth deities. The textual basis of this empowerment is from the teachings of the Bodhisattva So Nyingpo (Heart Essence of the Earth). The outer manifestation of the Earth Treasure Vase is as a vessel which contains images and mantras of the many divine beings which inhabit the Vase. It contains a host of precious substances of the earth such as gold, silver, turquoise, rubies, lapis, pearls, garnets, jade, amethyst, emeralds, and onyx. The Vase also contains minerals, water and soil from various sacred places such as Mt. Shasta, Lake Monoswar, Mt. Kailash, and the Atlantic and Pacific oceans. It contains grains and many sacred herbs from around the world. The inner nature of the Vase is as a celestial abode for Vajrapani, Jambala, Sadag Wangchen, six aspects of the Bodhisattva of compassion, Avalokitesvara, the Northern king Kuvera, No Gyun-ma, and the eight Naga kings. Ruling over these is the Bodhisattva of the earth, So Nyingpo, and the Goddess of the Earth, Ten Ma. The secret nature of the Vase is the increase of goodness and the elimination of evil.